Barb Iverson of Clackamas County Farm Bureau was elected to serve a two-year term as Oregon Farm Bureau's (OFB) first vice president. Iverson was voted into the position by the OFB House of Delegates, a grassroots body comprised of family farmers and ranchers representing county Farm Bureaus from across the state. The election took place on Dec. 6 during the 86th OFB Annual Meeting, which was held Dec. 4-6 in Salem. 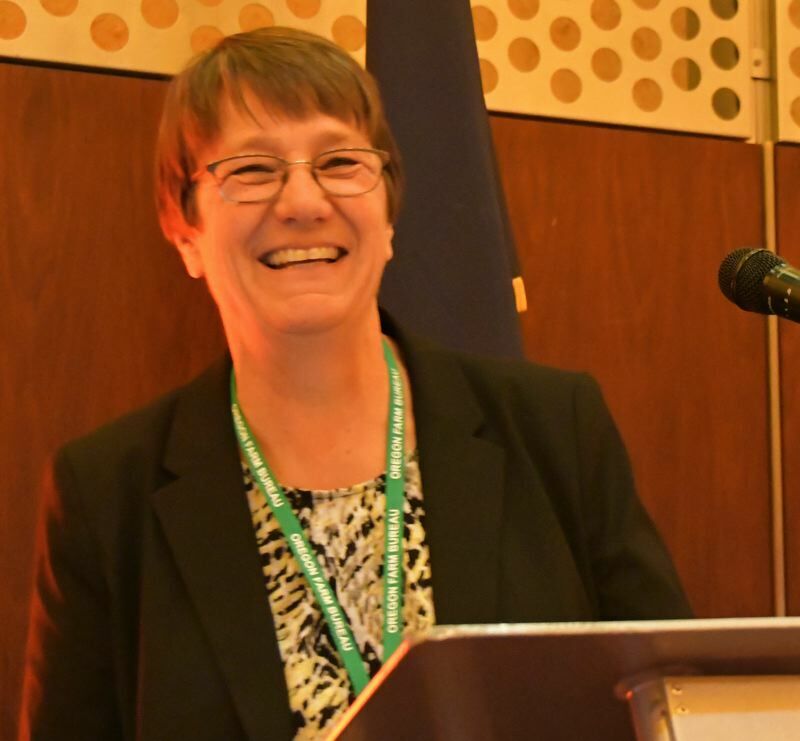 "Farm Bureau benefits greatly from Barb's steady leadership, expansive knowledge about farming and unwavering dedication to protecting, promoting and strengthening Oregon agriculture," OFB President Sharon Waterman said in a press release. "We're proud to have Barb as OFB's first vice president. She will do an outstanding job, as she's done in so many other ways for Farm Bureau at the county, state and national levels over the years." Iverson said, "Farm Bureau is such a great group of people, kind of like family. It's an honor to be able to serve the organization in this capacity." As OFB first vice president, Iverson presides over the OFB House of Delegates, is familiar with all financial records for the grassroots organization and assists the OFB president and OFB Board of Directors as needed. In January, Iverson will participate in the national American Farm Bureau House of Delegates as one of four seated representatives from Oregon during the 2019 AFBF Convention in New Orleans. Iverson's family operates the Wooden Shoe Tulip Farm in Woodburn, which raises tulips, industrial hemp, wine grapes, wheat and potatoes, among other crops.